Macron East Sussex Football League leaders Hollington United needed an added time equaliser to preserve their unbeaten record on Saturday. A last gasp Daniel Andrews goal rescued a 2-2 draw for the Premier Division pacesetters at home to fourth-placed Bexhill Town. Pebsham Sibex score one of their goals against Ticehurst at Buxton Drive. Ashley Kidman scored Hollington’s opening goal, but a pair of Kingsley Parsons volleys had put Bexhill on the brink of a notable victory. That result leaves Hollington a point clear of second-placed Battle Baptists, whose defence of the National Christian Cup began with a walkover at home to Milton Keynes-based Cleanslate - the team Battle beat in the quarter-finals last season. Third-placed Rye Town moved within two points of the summit on the back of a 5-0 victory at home to Ore Athletic. Rob Levett netted a hat-trick, Sam Richardson scored a wonder goal and Lewis Carpenter claimed his first for Rye, who had their goalkeeper sent-off. Fifth-placed Robertsbridge United came from behind to earn a 1-1 draw away to St Leonards Social in a tale of two second half penalties. Paul Barnes ensured the Bridge came away with a share of the spoils. Pebsham Sibex in possession against Ticehurst on Saturday. Sidley United are up to sixth following a 5-2 victory away to Hawkhurst United. A Sean Baldwin hat-trick and two from Arron Scrace got the job done for Sidley even though they had a man sent-off in the first 10 minutes. Robert Guile and Oliver Lawrence responded for the Hawks. Hawkhurst dropped to third-from-bottom after being leapfrogged by Sedlescombe Rangers, who triumphed 2-1 at home to Crowhurst. Dominic Bristow and Liam Baker netted for Sedlescombe, and Tom Andrew for Crowhurst. Division One leaders Northiam 75 suffered their first defeat of the season in any competition with a 2-1 loss at home to fifth-placed The JC Tackleway. A Kale Williams double won it for Tackleway, while Stephen Housago was on target for a Northiam side which finished with 10 men. Pebsham Sibex on the ball against Ticehurst. Northiam remain seven points clear of second-placed Bexhill AAC and third-placed Hastings Rangers, neither of whom were in action, but they have played two more matches. Westfield II consolidated fourth spot with a 4-2 success at home to Rock-a-Nore. Alan Johnson and Billy-Jo Driver scored two goals apiece for the Westies. Sixth-placed Mountfield United enhanced their top half aspirations with a 2-0 win away to Little Common II. Goals from Jake Hillier and Matt Tidmarsh got the job done for Mountfield, who also missed a penalty. With none of Division Two’s top three in league action, Hollington United II moved up two places to fourth via a 3-1 victory away to a Peche Hill Select side which had two players sent-off. Pebsham Sibex on the attack during their 10-0 victory at home to Ticehurst. Rhys Warren (2) and Ross Langton netted for Hollington, while Sam Harris-Green found the target for Peche. St Leonards Social II slipped to fifth on the back of a 6-1 defeat away to a Mayfield team for whom Simon Betteridge plundered a hat-trick. Draw specialists Wittersham shared the spoils for the fifth time in nine league matches following a 1-1 draw at home to Battle Baptists II. Gary Thompsett struck for second-bottom Battle, who remain level on points with third-bottom Wittersham. Division Three pacesetters Sedlescombe Rangers II weren’t in action and second-placed Punnetts Town seized their chance to close the gap by winning 6-1 away to Catsfield. Jack Divall bagged a hat-trick, and Louis Walder, George Coleman and Tom Goodey also netted for still unbeaten Punnetts, who are now just two points behind Sedlescombe with three games in hand. Charles Morgan grabbed Catsfield’s consolation. Two teams in the fourth tier hit double figures including third-placed Pebsham Sibex, who triumphed 10-0 at home to Ticehurst. Nick Gamble plundered a five-goal salvo, Dayne Beaumont helped himself to a hat-trick, and one each for Jared Beaumont and Dean Fuller completed the Sibex haul. Sandhurst were equally potent in front of goal as they won 10-2 at home to Hawkhurst United II. William Mantle led the way with four, Craig Walsh bagged a hat-trick, and Adam Boyd and Jason Baldock chipped in with one apiece. Joshua Macnab and Robert Wiggins retaliated. The clash between Magham Down and Victoria Baptists ended in a 3-3 draw. Thomas Post, Steven Cherryman and Graeme Whiteman found the target for Magham. Bexhill AAC II maintained their five-point cushion at the summit of Division Four by winning 3-1 away to sixth-placed Cranbrook Town. Goals from Matt Simmons, Lewis Wade and Ashley Wiggins gave the leaders an eighth win in 11 league outings. Bexhill Broncos dropped from second to fourth as a result of their game away to West Hill United being postponed. Orington, who have a game in hand on the leaders, went second with a 2-0 victory away to Parkfield. James McGrath and Aaron Lillycrop were the scorers. South Coast Athletico rose to third after extending their unbeaten run to eight league matches with a 1-0 success away to Burwash. Connor Easton scored the all-important goal for an Athletico side which had a player sent-off. Two Chris Williams goals and one from James Chambers gave fifth-placed Sovereign Saints II a 3-1 win away to Ninfield VFC. Liam Austin replied for Ninfield. The top two teams in Division Five are now level on points. Sedlescombe Rangers III were knocked off the top on goal difference after their run of nine consecutive league victories was ended by a 1-1 draw away to Icklesham Casuals II. Edward Manford Keen’s goal for Sedlescombe was matched by Daniel Russell for Icklesham. Hampden Park climbed above Sedlescombe courtesy of a 6-1 triumph away to AFC Hollington. Jack Bradley, Tobias Ekroth Smith, Daniel Welch, Craig Crowther, Darren Weller and William Coles scored for the new leaders, while Harry Kidd netted Hollington’s consolation. Fourth-placed Battle Baptists III won 5-4 in a nine-goal thriller at home to West Hill United II. Aaron Jamieson, Harry Loates, Chris Wakeford, Jamie Crouch and Byron Lear scored for Battle, while Daniel Wilkes netted a hat-trick yet still ended up on the losing side. Mike Hawley was West Hill’s other scorer. Herstmonceux II climbed to fifth by dint of a 2-1 success at home to Northiam 75 II. Strikes by Ashley Mutter and Waylon Smith won it for Herstmonceux, despite a Tom Powell goal for Northiam. Four of the league’s clubs were in Sussex Bluefin Junior Challenge Cup third round action and three of them made it through to the last 16. Division Two leaders Icklesham Casuals pulled off a terrific 6-2 win away to Diversity United. Sovereign Saints, who are just behind Icklesham in the league, were even more comprehensive winners, hammering Crawley United 9-0 at Shinewater Lane. Philip Broom netted four times, George Sambrook and Thomas Wilding struck twice each, and George Wheeler got the other. A Harry Milsom goal gave Wadhurst United a 1-0 victory away to Southwick Rangers, but fellow Division One outfit Herstmonceux went down 5-1 away to Whyke United. Toby Funnell grabbed the consolation. 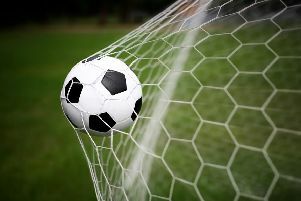 One other cup game was played and Robertsbridge United II came from 2-0 down to triumph 3-2 after extra-time against Beckley Rangers in round two of the Coopers Construction Challenge Cup. A Joe Maylam brace gave Beckley the upper hand until a Jason Marsh double after Bradley Lyne’s opener swung the all-Division Five affair in favour of Robertsbridge.